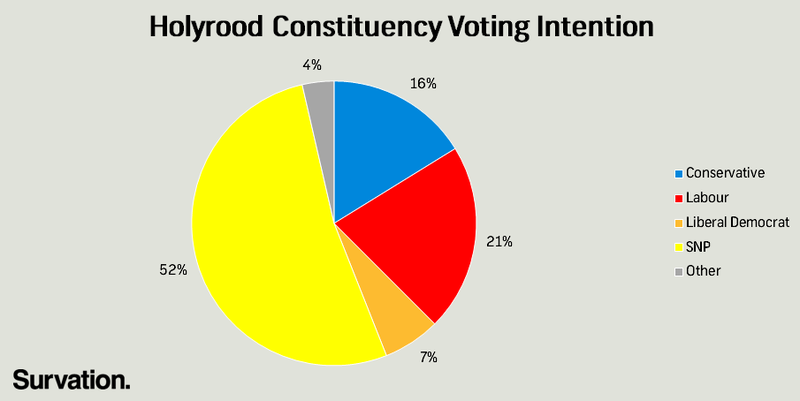 The first in a new series of polling by Survation for the Daily Record ahead of the 2016 Scottish Parliament election sees the SNP continue to dominate the political landscape in Scotland, with the Labour Party more than 30 points behind in the Holyrood constituency voting intention. 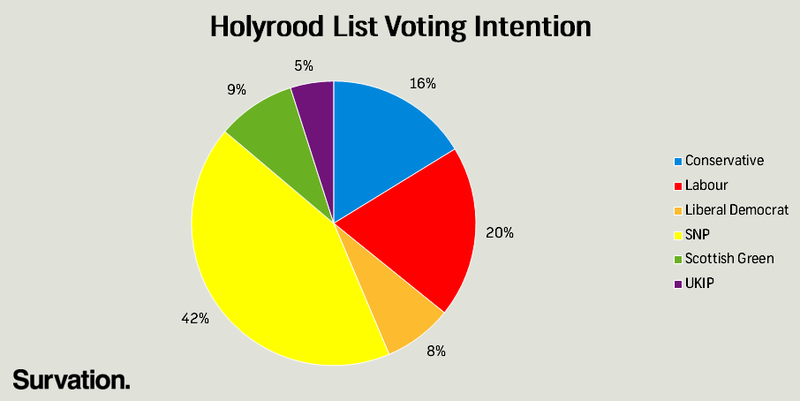 There also appears to be strong approval of the SNP’s record in Holyrood, with satisfaction for the Scottish government’s handling of all policy areas polled showing a net positive. Interestingly, the policy area with the lowest net satisfaction score for the government, the economy, was the only policy area polled which the Scottish Parliament does not have full responsibility for. The SNP also continue to outperform the other parties in the List voting intention, 23 points ahead of Labour, the next closest party. The List vote does also appear to show that other parties may improve on their performance in 2011, with the Scottish Greens on 9%, ahead of the Liberal Democrats by a point. Respondents were also asked to rank which issues they feel the next Scottish government should prioritise in order of importance. Seven in ten (70%) Scots placed ‘NHS & Social Care’ in their top three out of the thirteen issues given, with ‘Economy’ (55%) and ‘The cost of living’ (41%) also proving important. Interestingly, only 7% of Scots ranked ‘Constitutional affairs & Independence’ in their top three. Finally, respondents were asked to what extent they feel favourably or unfavourably towards a number of UK or Scottish political leaders. 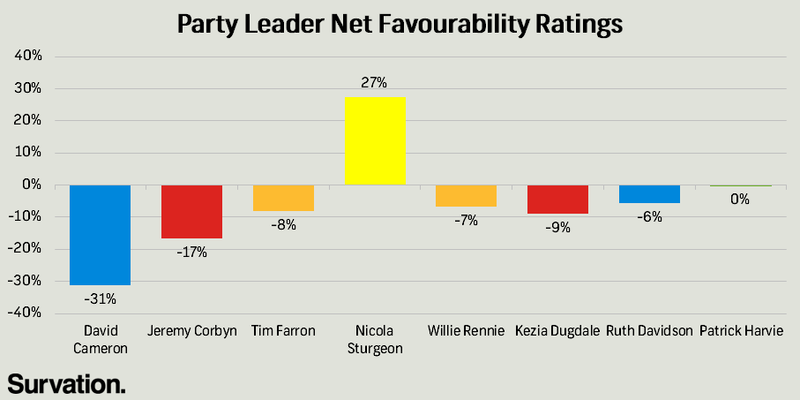 Only one leader had a positive net favourability rating; Nicola Sturgeon on +27%, with the next ‘best’ rating coming from the Co-convenor of the Scottish Green Party, Patrick Harvie (-0.1%). Westminster leaders tended to have worse favourability ratings than their Holyrood counterparts, with David Cameron (-31%) and Jeremy Corbyn (-17%) doing significantly worse than Ruth Davidson (-6%) or Kezia Dugdale (-9%). However, Westminster leaders tended to be more well-known (with Tim Farron the exception) compared to Holyrood politicians, possibly contributing to their more negative favourability ratings. Survation interviewed 1,029 Scottish adults aged 16+ from 8th-12th January 2016. Full tables are available here. 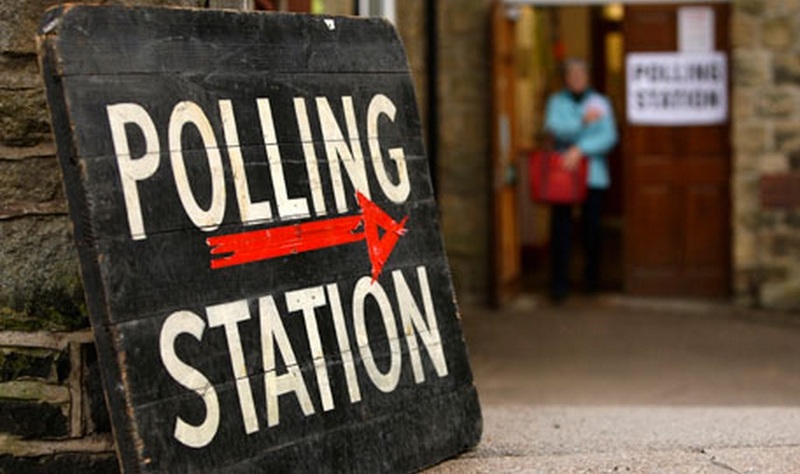 The General Election 2015 & The Polls – What Happened? Will “Some other party” decide General Election 2015?